The Rufous-bellied Nighthawk (Lurocalis rufiventris formerly Lurocalis semitorquatus rufiventris) is also known as Taczanowski's Nighthawk - honoring the person that described this species in 1884, namely W?adys?aw Taczanowski who was one of the most important European zoologists of the nineteenth century. This South American nightjar was formerly considered conspecific (one and the same species) with the Short-tailed Nighthawk (Lurocalis semitorquatus) with which it probably forms a superspecies. (Superspecies are closely related species with non-overlapping distributions; they are thought to have evolved from the same species). The nightjar, as suggested by the name, is strictly nocturnal. Throughout the day, it typically rest quietly in densely vegetated hiding places. At night, they become active as they hunt flying insects in more open landscapes, such as forest clearings, wetlands and along rivers. Thanks to their cryptic appearance, these birds blend perfectly into their habitat, making them very difficult to spot during the daytime, when they are usually hidden away sleeping. They are most easily detected at night when light from car headlights are reflected red from their eyes, as they are sitting on tracks or roads. However, their presence is most often made known by their loud calls given at dusk. The Rufous-bellied Nighthawks occur naturally in the Andean cloud forests, from western Venezuela to south-western Colombia, south through central Ecuador, western and southern Peru to western Bolivia. It is resident (non-migratory) throughout its range. They occur in several protected areas, such as Las Palmas Cloud Forest Reserve and Podocarpus National Park in Ecuador; the Megantoni National Sanctuary (Cusco, Peru) and Otishi National Park in Peru. This species inhabits subtropical and tropical moist montane evergreen forests and have been observed flying over the canopy at dawn and dusk foraging for insects. In flight, its mournful call consisting of descending series of notes can be heard. This species is difficult to spot due to its nocturnal habits. Its brown-mottled plumage keeps it well camouflaged during the day, when it is also usually hidden away sleeping. The Rufous-bellied Nighthawk is a large, dark nightjar with long wings, a short tail and a very short bill. Their soft plumage is cryptically colored to resemble bark or leaves. The throat is white and the wings and tail are all dark. The belly is a yellowish brown color, They have short legs and small feet, of little use for walking. 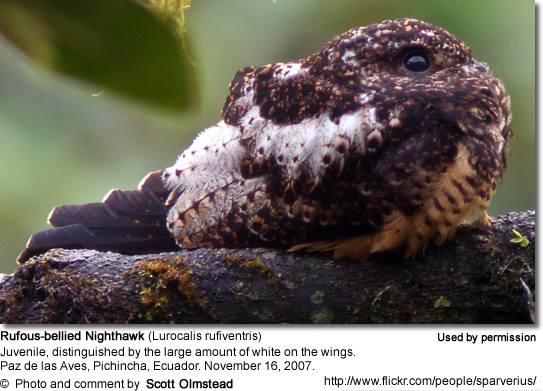 Rufous-bellied Nighthawks don't actually construct a nest, as most other bird species do. They simply place the eggs on the ground on open soil covered with dead leaves. The hatchlings emergee covered in down. Within 24 hours of hatching, they are capable of short-distance movements. The male usually stands guard and defends the nest and the young. He will hover in place near the nest with his body in a nearly vertical position. The adults communicate with their chicks via soft clucking sounds to which the chicks respond. The chicks are fed regurgitated insects by their parents, who will continue to brood them until fledging. The young take their first flight when they are about 20 to 21 days old.